Rest assured you are only getting excellent Western Spurs for a less than wholesale price. 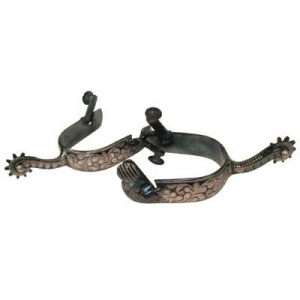 As you can see in the image above these are a very luxurious pair of spurs which feature antiqued steel with floral overlay pattern. You can see the high quality craftsmanship used to make these Blued Steel with inlaid Floral Pattern Western Spurs. This products is made with an elegant, simple yet a very modern style design.